So far in October we have talked about teaching respect and teaching self-control. Today, I wanted to cover an easy tip for teaching patience. We all know that kids DO NOT like to wait. They have something in them that needs things NOW. They need to be answered now and helped now and well... they usually just need everything now. A kids favorite word seems to be "Mom!" Whether they need help with homework, need a snack, need an answer to a question... they seem to quickly start saying, "Mom... mom... MOM!!!" until they are heard and/or helped. From the time our girls were little, we did not want them to be impatient with their needs. I wanted them to learn some patience. I wanted them to know that their needs aren't always more important than everyone else around them. Their wants and desires and questions are not necessarily a dire reason to interrupt me during a phone call or say my name a hundred times while I'm busy making dinner. I wanted my girls to understand and value the idea of being patient, of waiting to be answered, of understanding that when someone is busy... they can wait. So we came up with something to easily help my girls learn the concept of patience. If they need something or want something or have a question for us and we are busy doing something else, our girls will come up and lay their hand on our arm. They don't pat our arm over and over until they are answered. They hold their hand still on our arm so we know they need something. That way, if I am on the phone or having a conversation with another person, my girls know that I know they need me but they have a way to wait patiently until I can answer them. Whether we are at home or at church or at a friend's house or at the bank, the girls can put their hand on my arm and I know they have something to tell me or they have a question for me or they need my help. I can wait for a break in the conversation or a polite time to step away to help them. My stress level stays down and their manners grow. They understand the value of waiting and that their needs are not more important than what I'm doing. They also know that I value my time yet I also care about their needs. They know I will answer them as soon as I can depending on what I'm doing. Another thing I've learned about patience is that it goes both ways. If I am expecting them to patient for me, I should be able to be patient with them. I'm not talking about letting them ignore me or giving in to delayed obedience. I am talking about knowing that if our kids are genuinely busy with an activity, we, as parents, should be able to and can give them time to finish before we expect them to turn their attention to us. Letting them know that we can be patient too models patience to them in a new way they can respect. 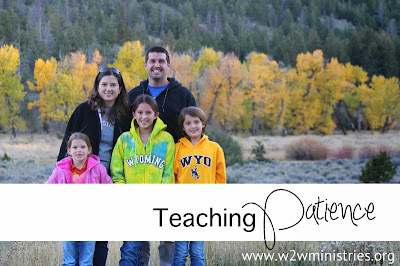 What are some ways that you teach patience at home? What is a creative way you model patience to your kids? Great advice, Jenilee! Definitely going to use this! I DO THIS TOO! I began this when my second child was old enough to toddle up and need me NOW! So, obviously, having two kids to pay attention to was increasingly difficult. I taught him to lay his hand softy on mine and if I put mine atop his, he knew I knew he wanted me. He would wait until I had a break in the work or conversation. We did this with the next two as well and it really made our lives so much more pleasant. I don't know why mom's think it's in our job description to allow ourselves to be pounded like the crosswalk button on the street corner! Now that they're older, (college even) they still want my undivided attention at their whim but I can say, sweetie, I want to hear you when I can give you the attention you deserve; give me five minutes. They know I'll focus on them when it works for both of us. Thank you for thinking of sharing this great advice! It works.